It’s been far far too long since we’ve talked mexican food. As in almost a month. Which is just completely unacceptable. So we’re about to remedy this situation. Meet my new favorite dinner. It’s good. Really good. And my impatient self has a really hard time letting it rest for about 15 minutes before digging in. To the point where several times I’ve just said screw it and cut a big piece before it had time to set up. And then proceeded to drop it all over the counter. Messy? Yes. But so delicious I couldn’t care one little bit. And you better believe that I licked every last drop of sauce off that counter. No shame. It’s like enchiladas without having to go through the trouble of rolling them up. Lazy man enchiladas. I like it. Just layer and bake. And those layers? Yeah – those are filled with crunchy veggies, black beans, salsa verde and cheese. Cheese me please. Now don’t get all weirded out when you see there is cottage cheese in the ingredient list. It doesn’t taste like cottage cheese at all – it just sort of makes it all nice and slightly creamy and plenty cheesy. Obviously. For the final touch you’ll broil the casserole at the very end so the top layer gets just a tad bit crunchy … kinda sorta. Oh so good. And then you’ll top it with plenty of avocado right before serving. The creaminess is the perfect finishing touch. Have I convinced you to make this casserole yet? Yes? Good. 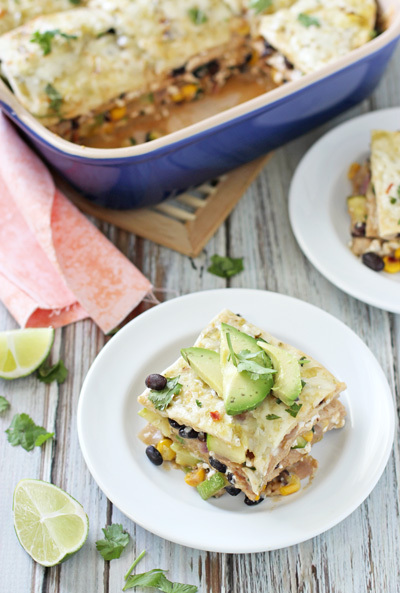 Recipe for vegetable enchilada casserole with salsa verde. Have cheesy enchiladas without all the rolling! 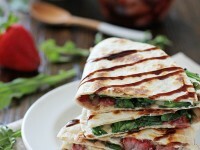 Layers of tortillas, veggies, beans and cheese. Set a medium skillet over medium heat. Add in the olive oil. When hot, add in the onion and cook for 2 to 3 minutes, until it starts to soften. Add in the zucchini and corn. Cook for another 6 to 9 minutes, until all the veggies are nice and tender. Transfer the mixture to a large bowl and add in the black beans, green onions, cilantro, cottage cheese, ¼ cup of the salsa, chipotle, cumin and paprika. Mix until well combined. Taste and add salt if needed (it will depend on your salsa). Add another ¼ cup of the salsa to a square (mine is 9×9) baking dish. Tilt the pan back and forth until it coats the bottom in a thin layer. Top with 2 of the tortillas (I rip them in half so they fit the pan better), ⅓ of the veggie mixture, ¼ cup salsa and ¼ cup of the pepper jack cheese. Repeat this process two more times (tortillas, veggies, salsa, cheese). End with a final layer of tortillas, salsa and then the remaining ½ cup of cheese. Cover the dish with aluminum foil and bake for about 20 minutes. Remove the foil, turn on the broiler and then broil for another 5 minutes, until the cheese is golden and bubbly on top. Remove from the oven and let stand for 15 minutes before slicing. Garnish with the extra cilantro and serve each piece with some diced avocado. *We use large whole wheat tortillas but feel free to use whatever kind of tortilla you would like (you may need to increase the amount if you use a smaller sized tortilla). Make sure that you like whatever salsa you use in this dish (and the spice level of the salsa). The one we use has a bit of kick, so the casserole itself has some kick too. You can also use a different kind of cheese (instead of the pepper jack) to reduce the spice level and/or reduce the minced chipotle, depending on your taste. We think the amounts listed are just right but that’s just us! Couldn’t read through all the comments, but was wondering if anyone has used corn tortillas in place of flour. Thanks. Hey Teri – corn tortillas will also work just fine here! The messiest are the best things!! Love this, I know my sister would DIE for this!! Must make! Yes, you’ve convinced me to make a casserole! I’m kind of in love with all the ingredients here especially the salsa verde and the fact that you have sliced avocados on top! I will take messy any day if it means this. It looks delicious. I love Mexican food, and I love enchiladas! This is the recipe for me! Love all the cheese and the vegetables – craving it now! My eyes always light up when I see a Mexican Food recipe. This dish looks so delicious and all the layers of flavor are calling my name!! Woot! haha right? I feel like I need to make up for the lack of mexican deliciousness lately! I am way too lazy/impatient to roll enchiladas, so this recipe looks like the perfect solution to me. The combo of veggies, spices, and salsa verde sounds amazing. And yes, I totally agree re: the cottage cheese. I add it to baked ziti/lasagna, and I love that it makes the sauce slightly creamier without adding a lot of fat. I bet it’s fantastic in this! Exactly! I’m such a fan of it in dishes like this! Oh yes, bring on the enchiladas! 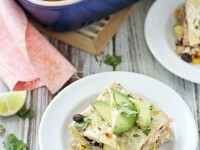 I have a similar veggie enchilada casserole that I make throughout summer. I just picked a bunch of squash from my garden so I definitely need to try these! Ooooo so jealous! I wish we had a bigger garden!! Wow! Girl! 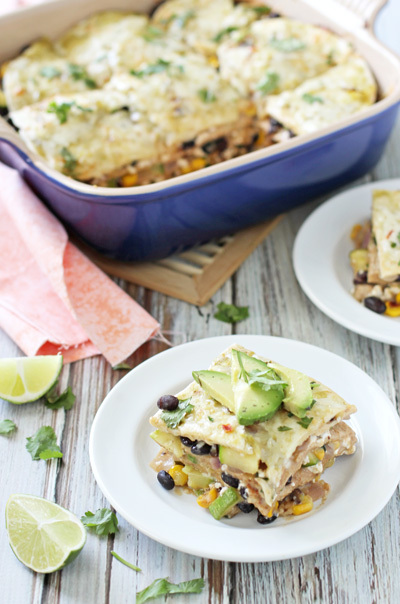 This enchilada casserole looks soooooo good! 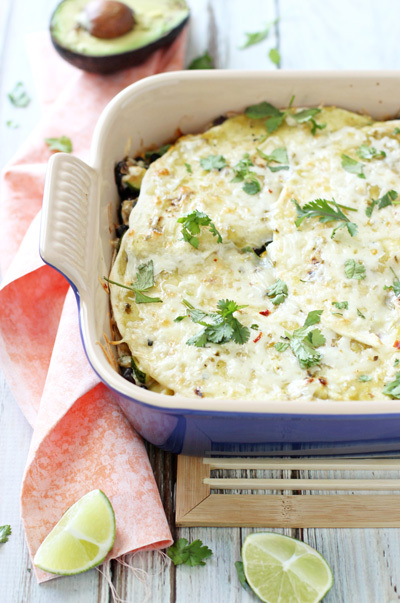 I love enchilada casserole but have never made with with salsa verde. Must try! You are definitely convincing, my friend! : ) Looks like a great meal to share family-style. And avocados are so good right now…love dishes like this where it really makes an impact. This looks incredible! I’ve never used cottage cheese in something like this before but it looks like it works really well! 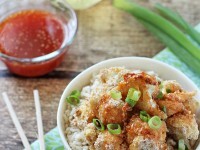 This is going to go on my list of dinners to try!! Love it! I’ve never wanted enchiladas so early in the morning, as I do now. These look delicious! I’ve never used cottage cheese in enchiladas before but I’m sure they are super creamy. Pinning! I agree, Mexican food is the best! I love that you used salsa verde and cottage cheese. It’s like the white pizza version of enchilada casserole. I’m definitely convinced!! This seriously sounds SO delicious!! I LOVE Mexican food that hides all kinds of veggies in it 😉 I’ll definitely be giving this a try. My mom made a sort of “mexican lasagne” once that was similar to this and I loved it. You’re right, layering in a casserole dish definitely takes a bit of the fuss away. This looks delicious and I love cottage cheese especially in savoury dishes! um YES PLEASE! this looks delish! This is going on our dinner meal plan as soon as possible! 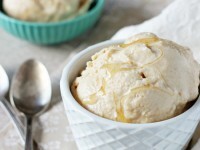 Yep the cottage cheese would usually put me off, but this looks delicious! What a super idea. I made a weird lasagne/fajita hybrid the other day that was amazing. I love playing around with mexican food. Great photos by the way, I always struggle with things like this! Thank you! Oh I know – sometimes the best tasting foods are the hardest to photo! This looks awesome! I’m totally craving it now. Love all the cheese and veg, and love how easy it is to make! It’s the layers that are making me drool, love all this casserolie goodness. I love how you incorporated all these tasty veggies. And added bonus? My husband just came home with 20 cans (20 cans I tell you!!) or organic black beans and I’m trying to use them up to now clean out my pantry. 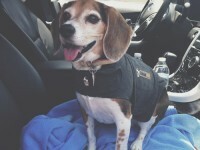 But I don’t dare complain because then he won’t be as agreeable doing the grocery shopping, ya know? I love adding chipotle peppers in adobo sauce to a dish – it lends such a rich, smoky texture – you have made such a wonderful dish combining it with salsa verde and all these veggies – good gosh – I could so face plant into this now! Messy meals are always the best meals. I doubt I’d wait the 15 minutes for this either, it looks fab! I haven’t made or had a casserole in a long while…this looks droolworthy, Ashley. Did you make your own salsa verde? Not for this recipe (I was feeling lazy! lol) … but it’s been on my must-try list forever! Oh my goodness Ashley I want this right now… for breakfast!!! It’s perfectly acceptable for breakfast, right? I mean, there are tons of good wholesome veggies in there 🙂 Ooohhhh how I love Mexicna food… and this looks amazing! Oh yes, you totally convinced me! So much so that I’ve already checked my pantry to see what ingredients I already have and now I’m heading to the supermarket to buy the ones missing! It looks too good not to give it a go. Like…right now!